Earlier this month I decided to walk from the Pacific Ocean to Century City, a distance of about six miles, along Santa Monica Blvd through both Santa Monica and Los Angeles. 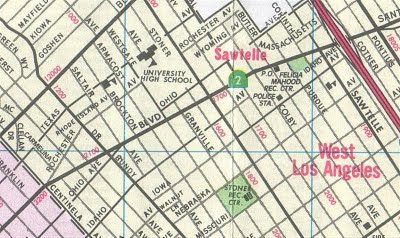 Santa Monica Blvd is technically "California State Hwy 2" - as you can see from this AAA map. But, unlike freeways, no one ever refers to it as "the 2." It's also the path of Historic "Route 66." The West L.A. Public Library, located at Santa Monica Blvd & Purdue, needs some love - and a new lawn. Sad, really. Not sure why some branches are in excellent shape, and others look like this. The Nurat Theater at Santa Monica Blvd and Sawtelle. A single screen theater with a historic sidewalk design out front. Showing a film I've never heard of. The Nuart specializes in "art" and independent films (above). Not my cup of tea, but this being Los Angeles, there's obviously a market. According to a recent Los Angeles Times article, L.A. City Attorney Carmen Trutanich wants to give police the ability to arrest "taggers" simply for hanging out together, without having to catch them in the act. http://www.latimes.com/news/local/la-me-southla-taggers24-2009aug24,0,138131.story. Sounds like a great idea, although I realize it also opens up other issues. None the less, I'm glad City Attorney Trutanich is addressing the issue. Continuing along Santa Monica Blvd underneath the San Diego Frwy (the 405) are a few office buildings at the corner of Santa Monica and Sepulveda. Santa Monica Blvd widens out quit a bit between Sepulveda and Century City (1.7 miles away). Mostly 2-3 story apartment buildings, offices, and retail: typical to much of Los Angeles. On the corner of Santa Monica Blvd and Overland is a large Mormon Temple and Visitors Center - the Temple is not open to the public; obviously, the Visitors' Center is. Several years ago, I had the opportunity to hear Jim Robertson, a former leader within the Mormon Church speak about his experiences: www.concernedchristians.com. Really interesting: dozens of Mormons, evangelical Christians and other members of other faiths came out to hear him speak (I realize this topic could be another blog entry). 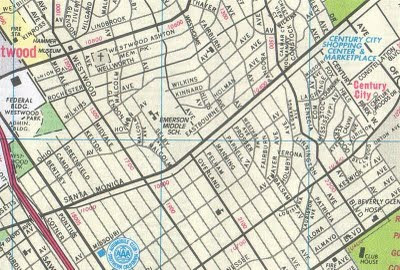 Onward to Century City in Part VI (my sixth and final post).